Harriet Price has the perfect life, she’s a prefect at Rosemead Grammar, she lives in a mansion, and her gorgeous girlfriend is a future prime minister. So when she decides to risk it all by helping bad girl Will Everhart expose the school’s many ongoing issues, Harriet tells herself it’s because she too is seeking justice. And definitely not because she finds Will oddly fascinating. Will Everhart can’t stand posh people like Harriet, but even she has to admit Harriet's ideas are good and they’ll keep Will from being expelled. That’s why she teams up with Harriet to create Amelia Westlake, a fake student who can take the credit for a series of provocative pranks at their school. But the further Will and Harriet’s hoax goes, the harder it is for the girls to remember they’re sworn enemies and to keep Amelia Westlake’s true identity hidden. As tensions burn throughout the school, how far will they go to keep Amelia Westlake and their feelings for each other a secret? Rosemead Grammar is a prestigious girls college in the affluent lower north shore of Sydney, achieving academic excellence for young women of the wealthy and elite community. It is imperative of students to preserve the sanctity of the Academy and Harriet Price is the epitome of exemplary students. Harriet is an achiever, an enterprising young woman immersed within the community, a virtuous prefect representative of the academy. Wilhelmina Everhart is a social and political activist, challenging the archaic, nepotism of the administration of the Rosemead Grammar. Conspirators responsible for Amelia Westlake. Amelia Westlake is a pseudonym, conceived to emphasise the predatory behaviour of a member of the teaching facility, a former Olympian and esteemed member of the community. The sexualised and indecent commentary of student bodies, innuendo and suggestive expression are disparaged, Rosemead Grammar absolved of their responsibility as the student concerns are disregarded. The allegations of sexual intimidation and predatory behaviour are a significant component of the narration and encourages conversations surrounding boundaries, consent and abuse. The girls of Rosemead Grammar are conditioned to tolerate the behaviour, including Harriet Price. Harriet's awakening is admirable. Superficially, Harriet is a sheltered, wilfully ignorant young woman of wealth. Beneath the naive, effervescent facade is a compassionate, intelligent woman, exploited for her appetite for gratification. Their unequivocal attraction engenders an incident of unintentional unfaithfulness, each young woman is in a respective, female relationship, each concealing their alliance from partners. Amelia Westlake is representative of young women who remain unheard, casualties of a patriarchal dominated society. A rudimentary and fundamental introduction to feminism, challenging socioeconism, elitism, chauvinism, institutional homophobia and ineptly, racism on several occasions towards a character of Asian appearance that was challenged belatedly within the narration. Reiterating the importance of the overwhelming necessity to create inclusive, affirming environments, Amelia Westlake encourages dialogue and camaraderie, sharing ideologies and empowering young women. Erin Gough, you are magnificent. Wow. Sounds like a perfect girl power book Kelly! It's brilliant and thoroughly entertaining, Erin Gough is fast becoming one of my favourite authors. I'm always a little leery of prank type plots. I end up not liking the people initiating them but this does sound like a very thought provoking read. They're more so political stunts conducted to raise social awareness, which I really enjoyed. I remember being a teen and feeling powerless, especially at school and the girls aren't being heard. It's an incredible read Karen and I'd love to see what you think of it. Oh wow. This is like straight from the news type of story, huh? So relevant. I'm sold. It truly is and with the #MeToo movement and talking to young women about their own empowerment, it couldn't have come at a more crucial time. I love books that introduce readers to not only feminism but books that push for young women to be heard and respected and this has it in spades. Really enjoyed it. Very thought-provoking, and intense. The kind of era kids today are growing up in and the things they have to deal with that books like this cover blow my mind. It's about time too isn't it. Books like Amelia Westlake start discussions of consent and empowerment of young women especially, something I desperately needed as a teen. Yay, I'm so glad you adored this book Kelly! I have it coming up on my TBR and I'm really looking forward to picking it up- the way the girls draw out the sexual predator with the pseudonym. It reminds me a little of Take Three Girls which I also loved. Yeah it did actually now that you mention it, very similar in terms of female empowerment. I felt the friendship wasn't as strong as the bond in Take Three Girls. Still a brilliant read nevertheless. Looking forward to seeing what you think of it Jeann! I've seen this one around but I didn't know what it was about. It sounds like it handles some really important, relevant topics well, which is wonderful. Thanks for your honest thoughts - fab review, as always, Kelly! Thanks Lauren. It's such a wonderful, feminist read. I haven't seen this one around, but I love the idea of a book bringing attention to the importance of inclusion and empowering young women. Affirming environments have also proven to be more productive than their counterparts. People like to be told they are doing something right, or being corrected in positive and constructive manner. This sounds like a Brilliant book Kelly! As far as I'm aware, it's only an Australian release so far but you can find most Aussie young adult novels on The Book Depository. Such an incredible read, I really enjoyed her debut novel The Flywheel as well. Ahhh! This book sounds good on so many levels... Where do you find all these books, Kelly?? You always seem to be reviewing such thought provoking books and I need to get on your level! Mainly I see them on Twitter. I try to follow as many traditionally published Australian and New Zealand young adult authors as possible, I just prefer their writing and I'm lucky enough to be sent a few review copies from publishers as well. I shall recommend you ALL. THE. BOOKS! another thought provoking aussie read. though would it resonate with the young people reading it though? I really believe so Ailyn. If twitter has taught me anything, is that teens struggle to be heard in environments of adults. 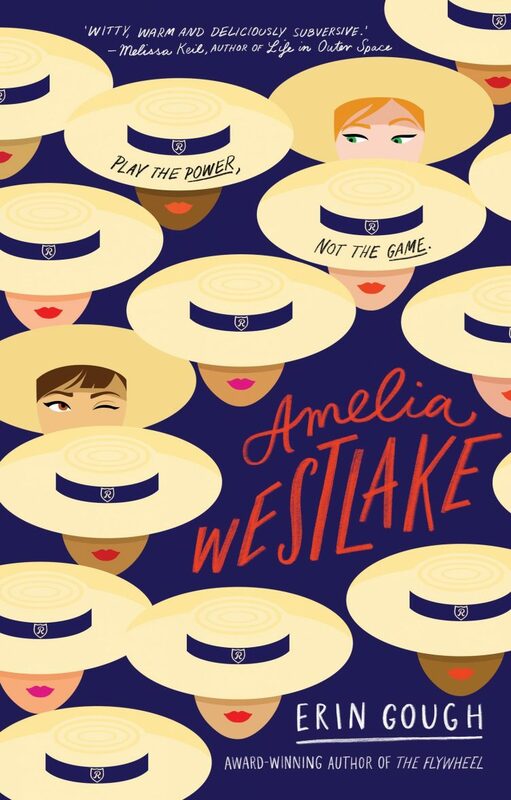 The essence of Amelia Westlake is teens wanting a voice and equality, something that resonates with everyone who has felt silenced. The Book Depository is a great place to find #LoveOZYA reads, free shipping too. It's amazing Aimee and one of my favourites this year. I'm glad you liked this one, Kelly! I did like how it was an introduction to basic feminism because I think it would be a great place for people to start, especially if they don't have friends or family around them who are doing a great job at integrating feminism into their lives. It truly was wasn't it. The inequality was glaringly obvious which is a great introduction when learning about feminism and what the moment is about. A few years ago I wouldn't have considered myself as a feminist, former waves of feminism were very exclusive towards white females only and although I was a strong believer of equality and the rights of women, the movement didn't include women of colour, transwomen or even women with disabilities until the rise of intersectional feminism. Well wow, you make this sound pretty kickass. Who knew a book could cover so much? I am all for feminist reads lately so this is one which is instantly going on my TBR. great review. I'm always seeking them out too! If you have any recommendations, throw them at me! Ooo I'd never heard of this book, but it sounds really good and my sorta thing - I'll definitely check it out now! !